You And Your Wedding Magazine is an exclusive and best selling bridal magazine. Wedding day is one of the most memorable days for everyone. Nowadays there are many magazines and websites which provide with excellent information to make a grant wedding. One among such is this magazine. 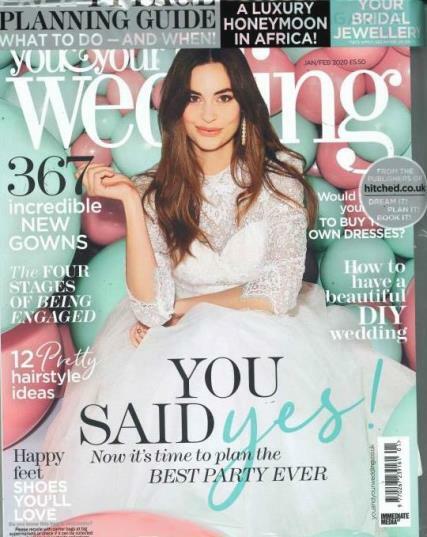 Published by National Magazine Company Ltd, this magazine reaches your doormat with exclusive news for brides. Buy a single copy or subscription to You & Your Wedding magazine. Each page of this magazine is fully packed with essential and interesting contents that are very useful and informative for all brides. This magazine is also known as bride’s planning bible. Here you can find all latest trends and up to date information, excellent features, essential advice and top tips, brilliant ideas, find your style and lots more. Along with these high quality and well written contents the magazine has also some free gifts that are very useful and interesting. There is an expert and experienced writers who provide with good stuff exclusively for brides. With all these ingredients the magazine has become very popular and entered into the hearts of many.